The list of apples grown at Queener Farm in Scio, OR includes many colorful names that span the alphabet: Alkemene, Coles Quince, Flowers of Kent, Hidden Rose, Lubsk Queen, Sansa, Yellow Bellflower and Zabergau Reinette are just a few of more than 100 unique apple varieties on the farm. The orchard was later purchased by Peter and Tommy VanderKamp, who added more European apples — British, Dutch and German varieties. They operated the orchard for about 20 years before Jeannie and her partners took over. “It’s hard to make obscure apples work economically,” said Jeannie. 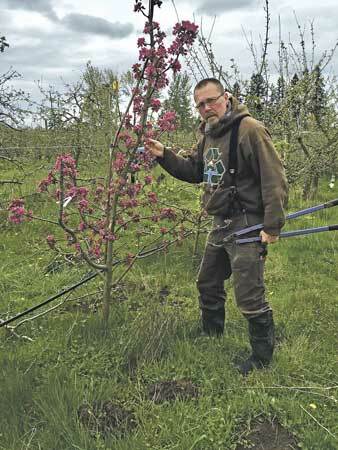 “It isn’t an efficient orchard, and not big enough to compete against large commodity growers. Peter and Tommy understood that and expanded the selection to 115 different varieties.” Peter and Tommy also developed a list of clients in Portland, OR, which helped move the unusual varieties to chefs and cider makers. Before Jeannie and her partners arrived on the farm in 2015, Jeannie had been a vegetable farmer and was familiar with the CSA model. “When I looked at all these different apple varieties and thought about how to market them, I came up with the Apple Club, which is basically an apple CSA,” she said. “People get a box of apples every other week during apple season; about seven or eight boxes total each year.” In addition to the opportunity to sample 50 to 60 apple varieties every season, Apple Club members receive a newsletter with information about the history and uses of unique apples. In addition to apples, Queener Farm offers plums, pears and a variety of berries including red, black, white and pink currants; gooseberries and aronia berries. About 50 varieties of table grapes will be added this year. The farm also hosts a hard cider club, which allows members to come to the farm several times a year for a workshop where they press cider and go home with a carboy. The session starts with a discussion about cider apple varieties, then members chop apples, operate the press and wash and fill bottles. Visit Queener Farm online at www.queenerfarm.com.